This map will lead you through a land of verdant forests, sapphire lakes, and breathtaking snowy peaks. Covering the areas from the Mt. Baker Wilderness and Norse Peak Wilderness to North Cascades National Park and Alpine Lakes Wilderness, this Mt. Baker-Snoqualmie National Forest map features a list of trailheads, parks, lakes, creeks, waterfalls, lookouts, and more. With over 140 miles of territory along the western slopes of the Cascades, this map features it all, including more than enough wilderness to explore to keep you hiking and enjoying this region for a very long time. Also included are a list of recreation sites, wilderness and safety tips, and key points of interest. NOTE: Many areas in this forest require a "day-use" fee. Get your pass now and save time - and maybe some money too! 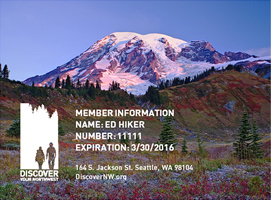 See our Northwest Recreation Pass Center for several convenient options, including the Northwest Forest Recreation ePass and Annual Pass. Features: Paper. 1999. Scale:1:126,720. 4 x 9 in. folded. 45 x 40 in. unfolded.